The core part of experiential marketing. Engagement is the term used when customers and marketers unite. They work together to see the evolution of a brand or service. It is a directly proportional relation where profit and revenue are directly connected to each other. Experiential marketing is called by many names like Participation marketing, event marketing, and on-ground marketing, but it all comes to the same meaning which is better interaction with the customers and building of trust which profits later in the business. Visibility- The first step involves being recognized in the market. Having skills is not enough, the implication is essential in this field. Thus, until you are visible in the market, to other marketers and customers, profits are awaited. Attraction-The second step involves attracting your customers. The marketer is supposed to create attractive content and place it in front of customers in the form of emails and texts. The material should be apt, valuable and educational on some level to gain the customer’s interest. Interest- After attracting your customers, you have to develop the interest in them. Just after them clicking your links and emails and blogs or e-books, your job is not finished. You have to show them the second look of the picture. Create strategies to lure your customers to visit your website again, or your physical store is the toughest part, indeed! Relationship- The interaction between the marketers and customers slowly and steadily turn into relationships which builds trust and value for the marketer. 5. Commitment- Keeping the customers happy is the job of the marketer. When the customers buy the products of their marketer, this is their commitment towards the marketer. 6. Growth-Customers talk! It is the basic rule that customer if satisfied with your service or product, will share their experience with friends and peers. This accounts for the growth of the company. While researching experiential marketing techniques, I figured that to understand the concept completely; I’ll have to uncover the reasons for the failure of traditional marketing methods which inversely led to the rise of former. Traditional marketing means include T.V, radio, newsletters, billboards, flyers and newspaper print ads. Etc. These techniques worked great in those earlier times where the effects of social media hadn’t taken over. But as the times change, new technologies develop, new techniques have to be introduced to stay number one in the market list. That’s when experiential marketing techniques took over. People love when marketers bring human essence to marketing. The emotional bond that the marketers and customers share has a significant effect on the marketing of products and services. Keeping consumers happy is the main motto of experiential marketing. This type of marketing works only on the fact, that customer will buy the products when they feel a human connection or rather a much personal connection with the brand, which is the work of a marketer to create that feeling of closeness. This is the only theory behind Experiential marketing which has shown skyrocketing amounts of profits and success as compared to the traditional marketing techniques. WHAT IS ‘BELOW THE LINE’ MARKETING? Below the line Marketing or simply BTL marketing is a less conventional method of marketing that emphasizes direct communication between the brand and the target audience. In this age of competition, more and more brands are approaching for BTL methods of marketing which in some way or the other is part of experiential marketing. BTL marketing was considered an extra add-on to the social media marketing strategies, but now it has paved its way out and proved to be a single vital type of marketing technique. Whenever small start-ups begin, and they need to advertise their products, they go for below the line marketing because of its comparatively low-cost methods. These methods are targeted towards a specific audience, which reaches them directly through the marketers. ‘Below the line’ marketing is a lot more affordable type of marketing than ‘above the line’ or any other. It provides for more opportunities for personal relations and trust development. It ensures excellent value for money. It gives superior returns on investments, etc. 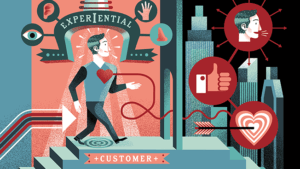 (84%) of customers find experiential marketing more human than any other form of marketing. And an even higher number (86%) agree that it gives them the opportunity to interact with a product or service, whereas traditional techniques like TV and other media just ‘tell’ them about it. Whereas, on the other hand, ‘Below the line’ marketing is still commanding low shares of a consumer’s budget, yet some savvy marketers are starting to catch on to the fact that customers like this interaction and find it more personal, memorable, effective and credible than other techniques. Experiential marketing because consumers are open to this type of marketing, the experience positively affects their purchasing decisions in a manner of positive associations with the brand.